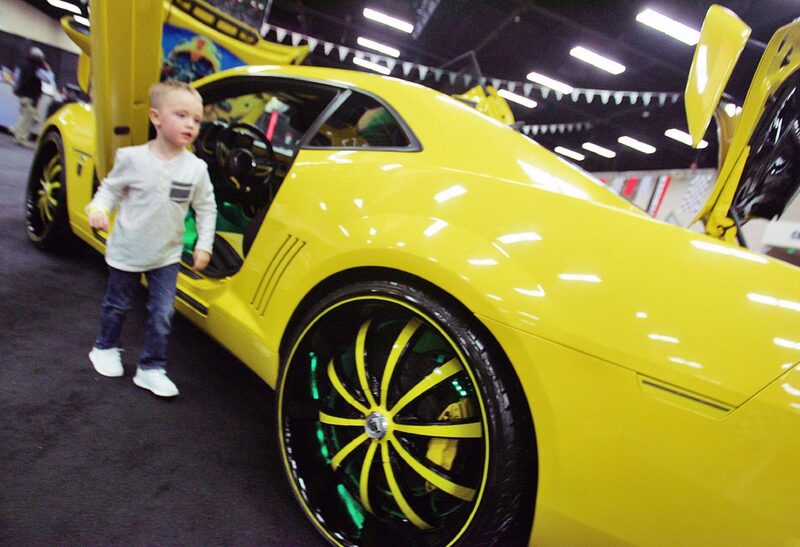 Brady Bortnick, 4, looks over a customized Transformer-themed 2010 Chevy Camero SS that he liked at the McAllen International CarFest at the McAllen Convention Center Friday, Jan. 26, 2018, in McAllen. 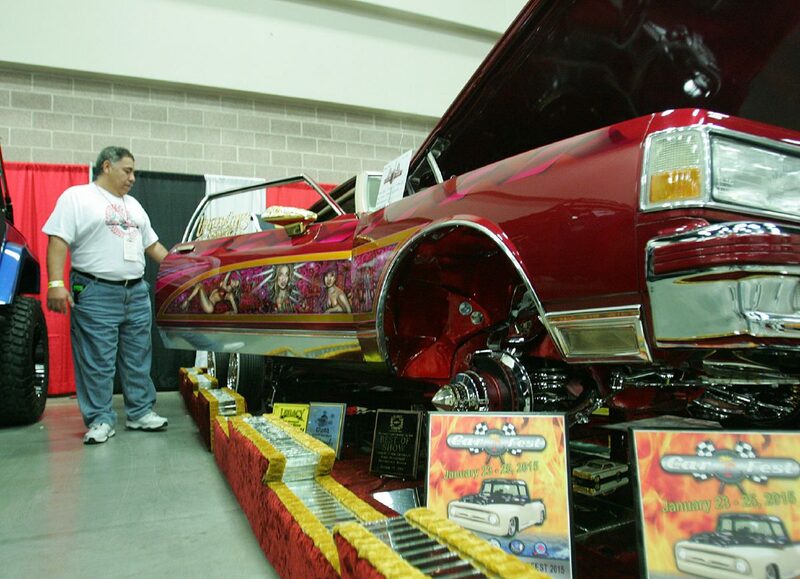 McALLEN — Resting inside the McAllen Convention Center Friday, the opening day of the eighth annual International McAllen CarFest, were a total of 275 vehicles modestly estimated to be worth $25 million. Upon entering the event, shiny and exotic vehicles immediately captured the eye. Engines gleamed, demonstrated by propped up hoods, and collectors of all ages and backgrounds engaged with one another to compare and show off their proudest features. Keith Ackerman purchased his red Lincoln Continental Mark IV for his wife in 1976. “I can say a little gray-haired old lady drove this car,” he joked. Car owner Don Palmer stands next to his 1956 Lincoln Capri on display at the McAllen International CarFest at the McAllen Convention Center Friday, Jan. 26, 2018, in McAllen. Car owner Fred Treviño stands next to his customized lowrider car that he built from an original 1984 Chevrolet Caprice Classic at the McAllen International CarFest at the McAllen Convention Center Friday, Jan. 26, 2018, in McAllen. It served as the family vehicle for five years, but these days he keeps it in his garage under a cover and takes it out for special occasions only. Friday’s CarFest was one such occasion. Despite his wife’s encouragements, he refuses to sell it. “Nothing’s been changed,” said Ackerman, who has obtained a collector’s license for the vehicle that boasts one of its original tires. This year, the cars were split and arranged by 60 classes, which included exotic, military and original Ford Model-Ts among others. 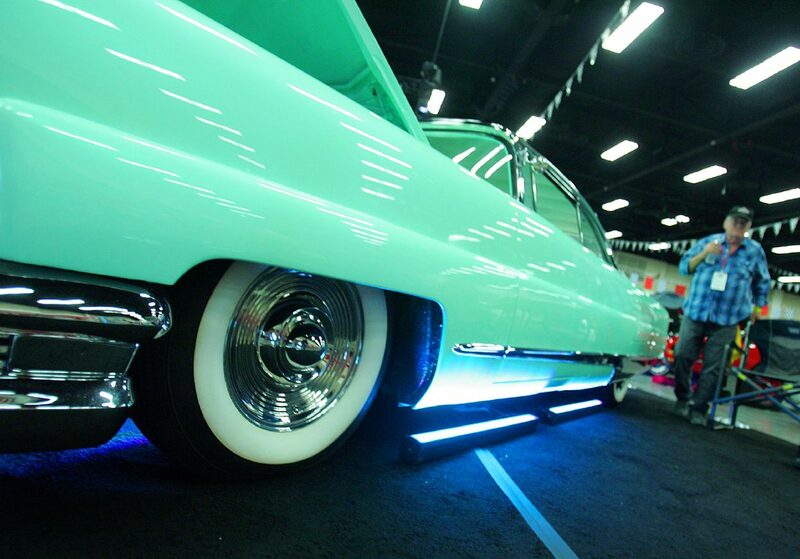 Al Diaz, operations manager for the convention center, called the event the biggest car show in South Texas. One car, he said, was driven all the way down from Ontario, Canada and other models in the room come from Reynosa, Tokyo, California and elsewhere. Families were seen strolling around, snapping photos or just gazing from one end of the room to another. Banners with checkered flags hung from the ceiling. Rick Linan from Harlingen was seen with a rag in his hand, polishing his 1966 GT350 Tribute. Four years ago he purchased it for his, at the time, infant daughter. Occasionally, he said, he’ll take it out to cruise with his now 7-year-old daughter and is saving it for her college graduation present, which is meaningful to him due to the amount of work he’s put into it and modifications he’s made. These include adding a new motor, transmitter, rims and tires. All 300 cars will be scored based on a point system. Judges from the Tennessee National Sweet Rod Association will be inspecting the interior, exterior and trunk. The most impeccable vehicle would receive a score of 125. Born and raised in Mission, Boydt Brandt has been involved in the car show for three years and not once has he walked away without first place in his categories. With a background in mechanical engineering, he has traveled around the world training people how to detail cars, which he likes to do with a soft toothbrush to provide a “show quality.” This year, five of his clients whose vehicles he’s laid his hands on have cars in the show, from a ’63 split window coupe to a ’57 Corvette. In the back right corner of the convention center, a group of three elder gentlemen stood proudly before their black vehicles — five, collectively — joking and laughing amongst themselves. Longtime pals Ricardo Martinez, Javi Rios and Roel Nava make up the “Alice Riders.” With a shared love and appreciation of cars, they enjoy taking their hot rods on the town to go on triple dates. “We mostly go downtown, get together and go eat with our wives,” said Martinez. What they enjoy about car shows, they said, is the camaraderie and getting to exchange ideas with fellow car enthusiasts. The show will continue from 10 a.m. to 9 p.m. Saturday and from 10 a.m. to 6 p.m. Sunday. The CarFest will feature a greater array of cars parked in the outside lot over the weekend. Tickets are available for purchase at the doors. For more information, visit mcallencarfest.com.